Waste Tech Disposal is dedicated to environmentally sound solutions for its residents’ solid waste management needs. Family owned and operated for three generations,where customer service and safety are paramount. We offer easy and sustainable waste collection and recycling service to residents. Container services to fit your business' needs. Our Roll Offs are perfect for your next remodel, gargage clean out, new roof. I needed a 30 yard dumpster to haul away kitchen remodel debris, like old cabinets, fixtures, and other materials. Waste Tech brought one out quickly, and I haven’t had any issues with them. I’m still using them to complete my project, and so far, I can’t find anything to complain about their service. I would definitely use them again. They’re doing a very good job with me. Waste Tech provided me with a 15 yard dumpster. Everything was fine with their service. They were very accommodating and let me keep the dumpster for a few more days. They told me to call them when I was done and that’s what I did. They did a really good job and I would use their service again. Needed a 15 yarder for a renovation project. I disposed of mostly sheetrock, lumber and related debris. Waste Tech provided us with the right size dumpster and they dropped it off on time. I didn’t have any issues during the 5 days I had the dumpster, and they picked it up on time when it needed to be emptied. I’ll use their service again if I have another project. They did very well and I do recommend their service. I got a 30 yard bin for a kitchen remodel. I’m glad I chose Waste Tech; they were great. They came on time and put the dumpster where I wanted it placed. I can’t complain about good service. I didn’t have any issues during the 12 days I had it. Reasonable rates too. I’ll definitely use their service again. I am loving this new way to recycle. I am able to recycle much more and feel “greener”. Love this new new Sort Free system, I am excited how easy the new bins are and how much more space they have. 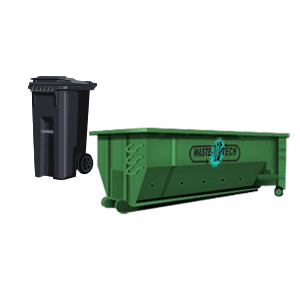 Waste Tech Disposal offers dumpster rental sizes for all types of trash removal projects, ranging from 10 to 30 cubic yards. Select a dumpster below to find the right size for your project. A 10 yard dumpster is perfect if you do not have a lot of waste to get rid of or the space to fit a larger dumpster. A 10 yard dumpster can hold 10 cubic yards of material, or 3 pickup truck loads. Great for garage or basement cleanouts and small construction jobs. 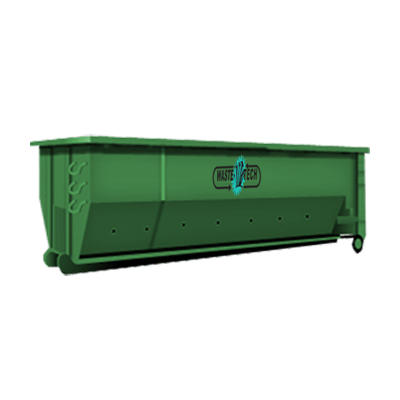 The 15 yard dumpster’s is our most commonly-rented dumpster size. A 15 yard dumpster rental is big enough to a home or yard clean up or a construction or roof job. Our 15 Yard can hold about 4.5 pickup truck loads. This container fits in almost any driveway with out taking up to much space. The 20 yard dumpster is a contractors choice, because of the ample room and low container sides. 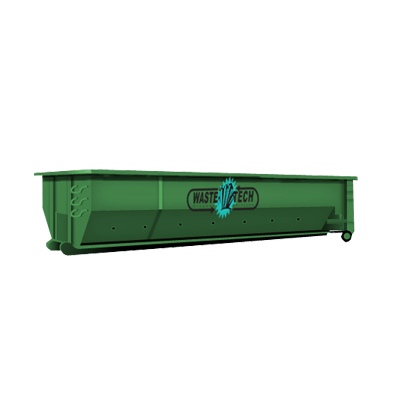 A 20 yard dumpster rental is big enough to handle a sizable amount of material, yet have the lower height makes it easier to load. 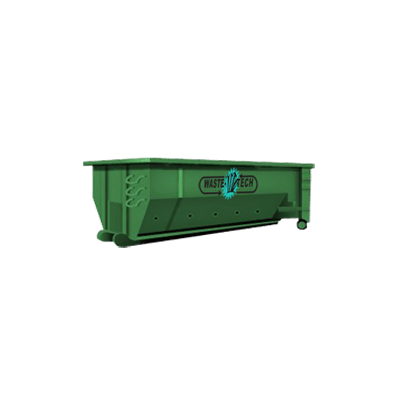 This dumpster is perfect for home renovations or larger home or yard clean ups. The 20 yard dumpster can hold 6 pick up truck loads. A 30 yard dumpster the best dumpster for larger projects, at your home or business. A 30 yard dumpster can hold 30 cubic yards of material, or 9 pickup truck loads. This is our largest container and is a perfect fit for construction sites, large yard clean ups or home renovations. Have you called multiple companies and received many different Dumpster rental prices ? Depending on the materials you are disposing of and the amount of time you need to get the job done, prices can vary. At Waste Tech, we offer simple no hidden cost flat-rate pricing! When you rent a dumpster from Waste Tech we have longer rentals and better terms than many of our competitors. Also, you are renting directly from the hauler, not an online broker. 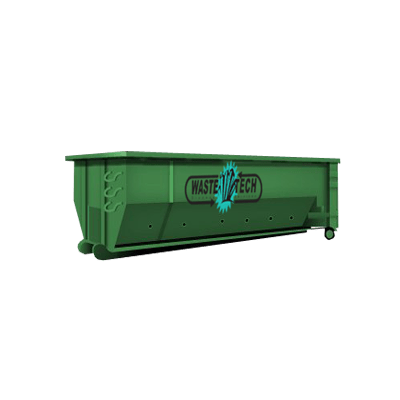 WHAT IS THE COST OF A DUMPSTER?